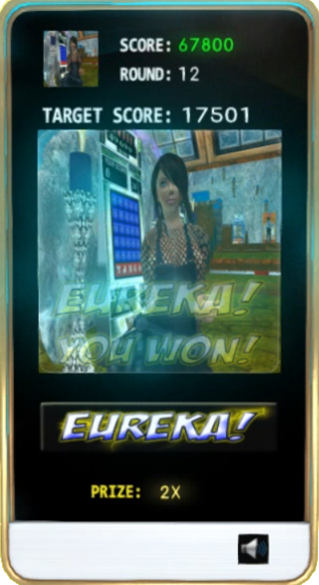 Eureka is based on 4Play classic, with a brand new design and an interesting twist in the appearance of rewards. It is a very playable game. 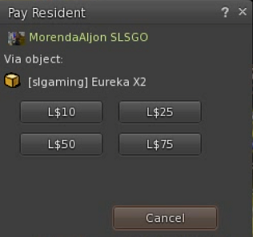 As all our games, Eureka! is a skill game. 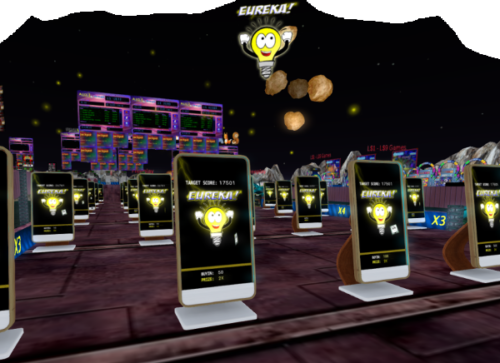 Before throwing money in it and hope that luck will bring you a victory, read about Eureka! on this page, and perhaps practice a bit on freeplay or cheap games. It will definitly help you to guide your luck in the desired direction and it will help you to love this game. 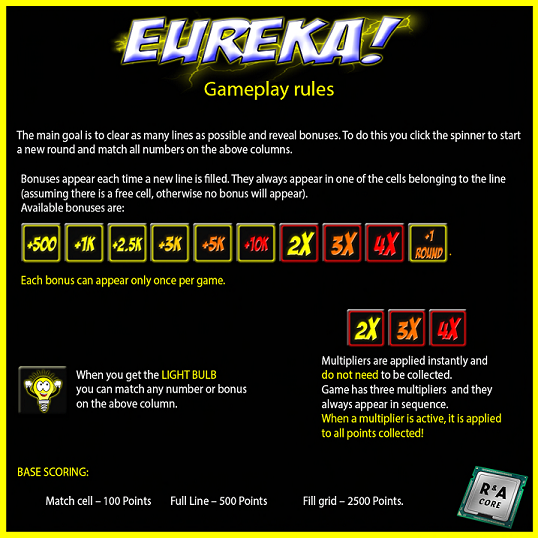 The rules of Eureka! are compressed in the rules board as you see here to the right. The game has 12 rounds, plus possibly one extra round which you could gain as a bonus. Each round you use the spinner to match tiles – when the number appears on the spinner or with a light bulb and you can collect bonuses with the light bulb. There is no such thing as a guaranteed number of matches you can make or bonuses you can collect during a round. Bonuses and matches give points. At the end you need to have enough points to beat the target score. Explanation of the Eureka! rules, as provided by the creator of the game>i? An Eureka game machine, ready to be played, looks like the picture here to the left. Thus this game costs L$10, and when you beat the target score it pays you twice the cost. As common with game machines in SL, when you pay it you can also choose to play for another amount. If you play for e.g. L$20, you can win twice L$20 = L$40 when beating the target score. I pay the game L$10, and then it comes to live. On the top of the game board I see that my score is 0, I am in round 1 and the target score is 17501. Then I see the playboard and below it the spinner. Below that the prize for what I play is shown: L$20 (being 2 times the L$10 I paid). On the spinner I see the numbers 7 and 12 in the first 2 columns. These numbers cannot be matched on the playboard and thus are useless. The 3rd column gives the number 25, that can be matched. The 4th column a light bulb. That light bulb can be used as a wild. 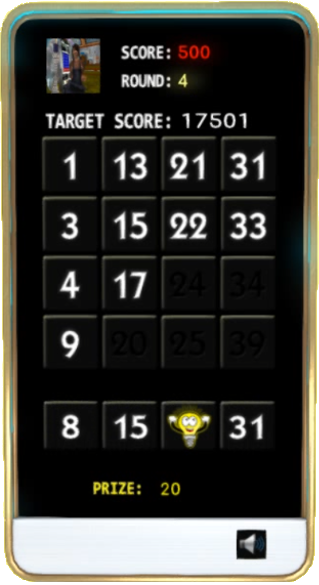 So I can play any number of my choosing (31, 33, 34 or 39) on the 4th column. I click the number 25 on the play board. 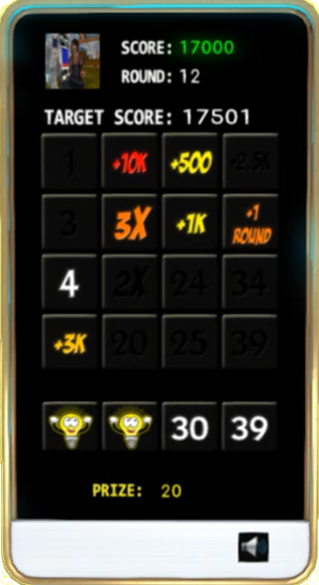 Make sure you click the number on the play board and not the number on the spinner. Clicking on the spinner indicates that you want to move to the next round. So you would loose the matches in this round. After playing the 25, we see that number greyed out on the play board, and above the board we see our first 100 points. Matching a number gives 100 points. The light bulb can be used as a wild. I can play it on any number in the same column. This time I can choose between 31, 33, 34 and 39. Way too often players think “Ah well, we don’t know what the future will bring, so I just pick one of these numbers”. I also don’t know what the future brings, but we do know a lot about the likelihood of things. A player who thinks on this way will loose a lot more games than a player who takes diagonals serious. Besides matching numbers we want to match lines, on Eureka! we even want to match lines as early in the game as possible, for the bonusses. At the end of the game you often have a few numbers not matched. Each number is on a horizontal and a vertical line, but some numbers are also on a diagonal line. So, when it furthermore does not matter which number you match, match one on a diagonal. You will win more games. That leaves the choice between 31 and 39. 39 is also on the same horizontal line than the 25 we just matched. Choosing 39 instead of 31 means this round will end with already one line (the horizontal line on the bottom) that only needs 2 more matches. Thus, it does matter where you play your wilds, and in this case 39 is by far the best choice. 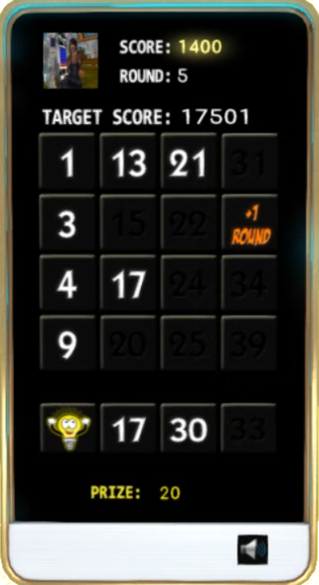 After playing the 39, I click the spinner to move to the next round. (The spinner is the row below the playboard where the number and light bulbs appear). I matched 2 tiles, so I have 200 points upto now. Don’t think like that, it is crap: I had no way of knowing that 39 would come up this round. When we had played 31, we might have ended up with 31 coming up this round. The likelihood would be exactly the same. In this 2nd round I cannot match neither 6, nor 23, nor 39, so all I have to do is find the correct spot to put the light bulb on. Best play it on a diagonal, so that would be either 15 or 17, where 15 is the better choice as already one other number of that diagonal is matched. However, 20 is a better choice in this particular situation. It is important to make lines as early in the game as you can, 20 makes that already 3 out of 4 tiles of the bottom row are matched. I click the 20, and then click the spinner to move to the next round. We start the 3rd round with a louzy 300 points from the 17,501 points needed. But that’s ok, it is going rather well so far. Most of the points are made near the end of the game when bonuses and multipliers kick in. I cannot do anything with 7 and 14, thus how to match these 2 light bulbs? My choice is 24 and 34. This way I create 4 lines (one diagonal, one horizontal and 2 vertical) that only need two more numbers matched, and that is one more of these lines than when trying to put both matches on a diagonal. Diagonals are important but in Eureka! making lines fast is even more important. 24 and 31 would have been a good alternative choice. Playing both numbers on a diagonal. I doubt which is the best, 24/34 or 24/31…I am not sure, but all other alternatives, including 22/31 would be a worse choice than either of these. I click 24, then 34 and then the spinner to move to the next round. Not much thinking required on this 4th round. I can play the 15 and 31 and place the light bulb on number 22. With the light bulb I have a choice, 21 or 22 but since there is absolutely no good reason why 21 would be a better choice, the choice has to be 22 which is on a diagonal. Rounds like this are easy, just make your matches and go on to the next round. But they are also tricky, you have to stay sharp: Don’t overlook a number. Missing a match that you could have made could easily cost you a victory. Matching a tile now gives only 100 points, but the matched tiles are the way to matching lines and then, after that, gaining bonuses. I click 15, 31 and 22 and then the spinner. For the 5th round we get what we need: We will make some lines. I can make the matches for 17, 33 and have a light bulb. The best spot to play the light bulb is on 9, it is on a diagonal and we I will make 3 lines this round (the right most line, the bottom most line and the diagonal), in each alternative option, including playing 1 instead of 9, that would be only 2 lines. So, I play 9, 17 and 33. However, not in that order. Playing 17 as the last number has an advantage: 17 itself does not complete a line, only after 9 is also cleared. 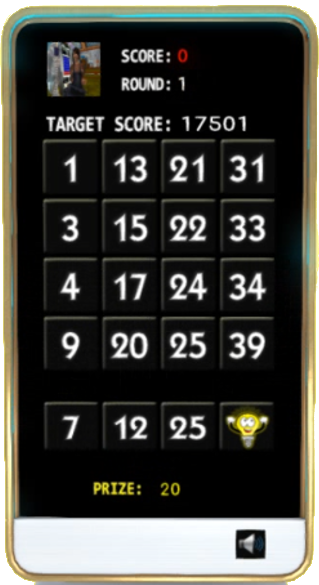 It is possible that one of the lines contains the 2x multiplier. When I get that, all score made after getting this multiplier will be multiplied by 2. Thus playing 17 as the last match does increase the chance we get the 100 points for matching that tile double. This is not a gigantic advatange, but each point extra is a point, let’s not waste this free opportunity for 100 extra points. I start with playing 33. Let’s see what happens. I made a line with matching the last tile on the right most vertical line. Thus, 100 points for matching the tile and another 500 points for matching the line. My score is up with 600 points. At the line I matched a bonus is revealed: “+1 ROUND”. This does not mean I won an extra round. It means I can get an extra round if I later during the game collect this bonus. 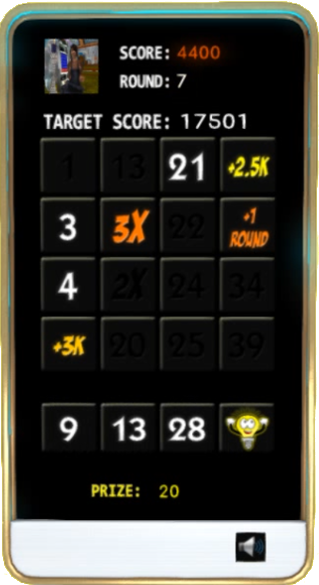 Multiplier bonuses are effective immediatly, all other bonuses only have a value when collected. The bonus is on the field where I matched the 33. This is a coincidence, it is placed on a random spot on the line, so it could have been on any of the 4 spots of this vertical line. Let’s match the 9 and 17 also. After making all matches in the 5th round and clicking the spinner to go to the next round, I got another 2 x 500 and 2 x 100 score for the lines and tiles I matched. 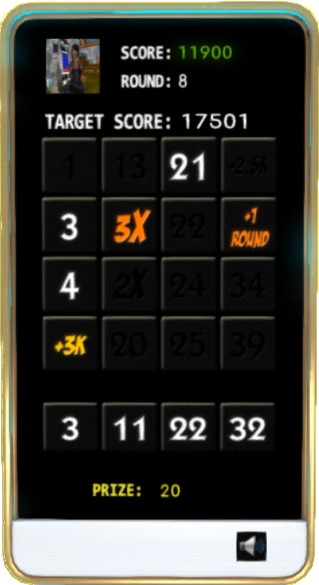 For the horizontal line a 3K bonus became collectable, for the diagonal a 2.5K bonus. We are in the 6th round now, with 2 light bulbs to play. The light bulb in the 2nd column doesn’t give any other choice than playing the 13. So, let’s do that, click 13 and see what happens. Clicking the 13 completed the vertical line. So, we are 100+500 = 600 points closer to our goal, and we revealed a reward. This reward was a multiplier, multipliers do not need to be collected but are effective immediately. From now on, all scores we make are doubled. Where to play the light bulb in the first column? Matching a number would complete another line, since there is no reason to choose one of the other numbers, the 1 would be the best choice, it is on a diagonal. But, I can also not match a number and instead click the “+3K”, that would give me 3,000 points and since we have the x2 multiplier, multiplied by two, thus 6,000 points. Teasing as it is, to almost triple our score, we will have to aim for something bigger than 6,000 points in order to ever come near the score we need to beat. More important even, at the left most column there is still only one number already matched. This column effectively blocks our opportunity to make more lines, only the 3rd vertical line is still an option. Making an additional number match on the first column seems wise. Thus, we play the 1 and click on the spinner to move the next round. Matching the 1 completed the diagonal line. Since the 2x multiplier was activated, it did give us 1200 points, instead of 600. As you see, matching the line activated another multiplier. From now on, all our scores will be not multiplied by 2 but by 3. The 8th round I can choose between 3×2.5k = 7,500 points or an extra round. I click the +2.5K reward and then the spinner to go to the next round. The 8th round gives not much to do. I click the only match I can click, the 3, and then click the spinner to move on to the next round. After matching the 3, we click the spinner and go to the 9th round. Matching the tile and completing the line gave us 600×3 = 1,800 points.That is more points in one click, than we got in the first 4 rounds combined. We are marching fast towards our goal of 17,501. Matching the tile also revealed a 1k bonus. But in this 9th round we won’t march a lot. The spinner is giving us no matches at all. The only sensible thing to do is clicking the spinner with an angry expression on our face, hoping the 10th round will be any better. Oh my goodness! The 10th round s**ks too. Frankly, it is not really a strange and remarkable accumulation of bad luck. It is totally normal to have a few rounds with no match at all. Let’s just click the spinner and see what the 11th round brings. 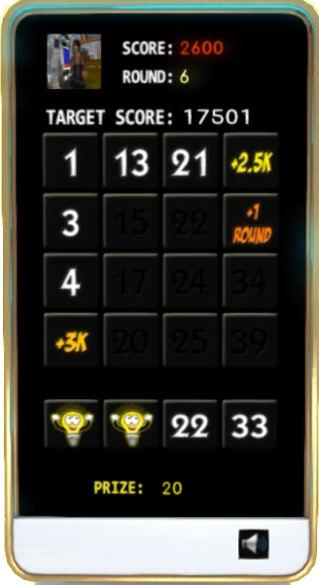 – Match the 21 and thus get 3,300 points plus two extra bonuses, one on the horizontal line and one on the vertical line. Our score will be 17,000. – Match the 1k, our score will be 13,700+3×1,000 = 16,700. In both cases, if we get in the next round a light bulb in either the first or the 3rd column: We will win. In both cases, if we get in the next round the number 4 to match, we will win. 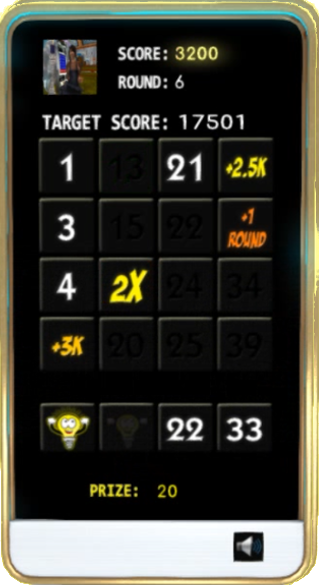 When playing the 21, we will get a new bonus to collect, this could be in either of the columns. If this is the 3rd or 4th column and we would get the next round a light bulb in the same column, we will also win. Even the lowest bonus (500 x3) is enough. Only the x4 multiplier would be irrelevant. 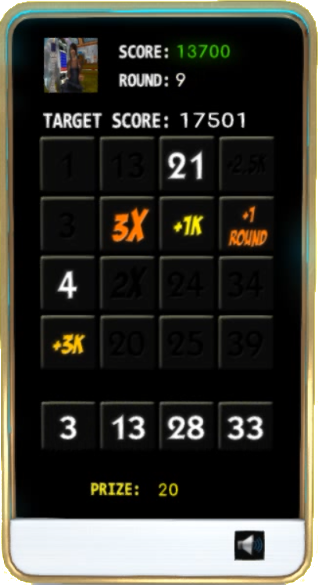 When playing the +1K, also getting the number 21 in the next round would be enough to win. I click the 21 and hope for the best. If I see the analysis I wrote myself in the previous paragraph, +1K might have been a slightly better choice. I still play the 21 anyways, simply because I did not took enough time to think while playing. The difference between both options is minimal. 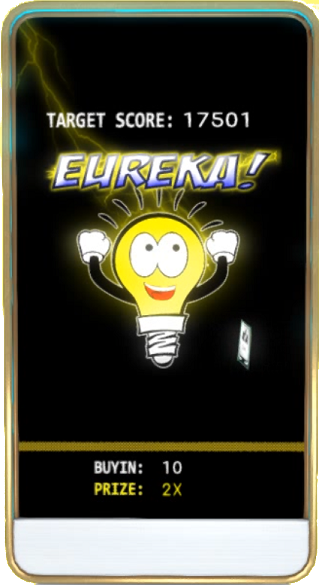 The 21 revealed a nice fat bonus, 10K, and the 12th round brings us 2 light bulbs. 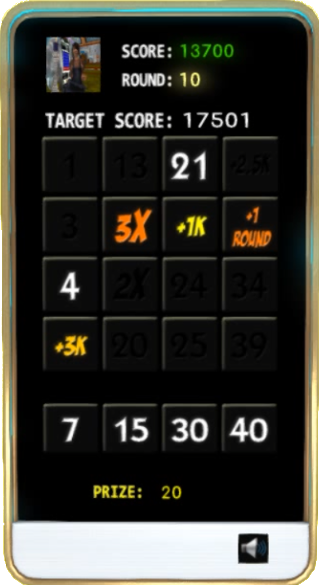 Playing one of them, either on the 4, the +3K or the +10K would already be enough. But hey! Let’s play the 4. 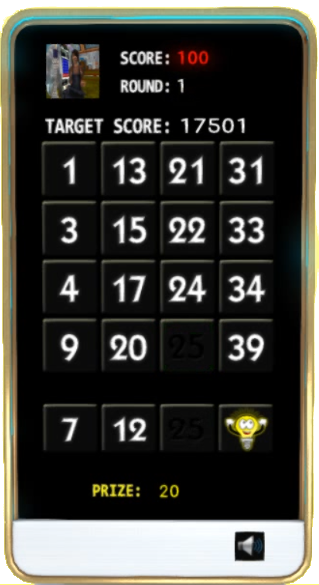 We will get a load of points, also for completing the board. It is for sure also the 4x bonus will be revealed. After that I play the +10K, which will give us that 10k multiplied by 4, instead of 3. We will win this game, with a very nice score. With a big smile on my face, I play the 4 and then the 10K. And there we go…this game was won!! I hope I showed you in this walk-true that Eureka! is a great game. As all skill games it requires you to play smart, but surely without spoiling the fun of playing. Weight your options when you have to make a choice, think about those diagonals and make sure you made all matches. In some cases, make your matches in the smartest order. That’s all. As always, best practice on freeplay games or low cost games. It doesn’t require a study but you’ll need to play some games to become good at the game. We wrote this page with caution, verified the details, etc.. Still it is purely informative. In case of an error or mistake, we apologize, but that’s all. You cannot claim any rights on the text above. 4Play Classic The original 4Play !! A true SL Classic. Crazy Animals Make these animals run to the finish line. Deal Classic S A true classic, with a bad banker and a lovely lady. Eureka! Great looking fast game in the 4play family. Lucky Rainbow Collect those pots of gold! Moon If you like a challenge. No Devil A great SL classic. Lonely at the top. Plumber Fix pipes and earn rewards on this beautiful machine. Spin2Pot Keep that wheel turning!! Witchcraft Mixing potions, brewing high scores.